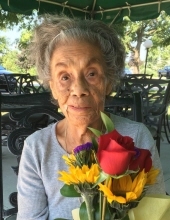 CLAUDIA FLORENTINI RIOS RAMEY,98, of Gettysburg PA passed away peacefully at SpiriTrust Lutheran on January 30, 2019. Claudia was born August 23, 1920 in Huayopampa Peru. She came to the USA in 1948 and became a US citizen in 1985. She and her late husband, Francis (Frank) resided in Arlington VA, Germantown MD and arrived in Gettysburg PA in April 2003. Her son Luis Navarro Rios predeceased her. She leaves behind granddaughter Lara Navarro Roach, of MD, grandson Antonio Navarro, of MD and 4 great-grandchildren (Lara), cousin, Victor Quiroz, of Peru, niece, Vilma A Otiniano, of Peru. Claudia was faithfully loved and cared for by Marilyn Ramey and Raymond Hopkins since the passing of her beloved Frank. Internment at Arlington National Cemetery in Arlington VA. Monahan Funeral Home in Gettysburg are in charge of arrangements. "Email Address" would like to share the life celebration of Claudia Florentini Rios Ramey. Click on the "link" to go to share a favorite memory or leave a condolence message for the family.